Jamie left in the upper sixth to attend the Royal Academy of Dramatic Arts in London. 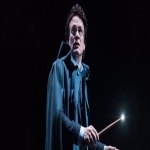 Harry Potter And The Cursed Child, in which Parker played Harry Potter, made theatre history at the awards at the weekend, after winning a record-breaking nine Olivier Awards. Parker told how his predecessor in the role, movie actor Daniel Radcliffe, gave him his blessing before opening night. He had parts in the ?lm 'Valkyrie' with Tom Cruise, and, on television, in Parade’s End, Silk, Silent Witness, Wire in the Blood and Foyle’s War. Jamie also recently scooped the 'What's on Stage' award for 'Best Actor in a Show' for his performance as Harry Potter in Harry Potter and the Cursed Child.